A new economic report, published today by the charity Rethink Mental Illness and PSSRU at LSE, has found that investing in quality care and support for people with schizophrenia and psychosis, results in huge savings in the long-term. 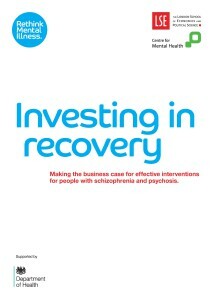 The report, Investing in Recovery, makes the business case for investment in 16 different types of care for people with schizophrenia and psychosis including peer support, family therapy and Cognitive Behavioural Therapy (CBT). It shows how investing in proven services such as Early Intervention can generate significant cost-savings for the NHS because it reduces the need for hospital beds. The analysis found that £15 is saved for every £1 spent on early intervention. The findings will be presented to government ministers and NHS leaders from across England today at the country’s first ever ‘psychosis summit’, to be held in London. The summit’s aim is to bring NHS leaders together to identify a lack of investment in quality services for people with schizophrenia and psychosis, and to work together to find solutions. Rethink Mental Illness is calling for more money to be invested in community services, which will reduce the need for expensive hospital beds. It costs an average of £13 a day to support someone in the community, compared to £350 a day in hospital. Victoria Bleazard, Associate Director of Campaigns and Policy for Rethink Mental Illness said: “Mental health is chronically underfunded. It accounts for 23 per cent of the disease burden in England, but gets just 13 per cent of the budget. On top of this, NHS spending has been essentially frozen in real terms until around 2020 and mental health is once again being cut disproportionately, despite the Government’s commitment to equality between mental and physical health. “Not only do we want to see mental health getting a fairer share of the budget, but we also need to make sure that the money that is available is spent as efficiently as possible. In this climate, it makes no sense to cut mental health services which generate cost-savings and save lives. Short-term cuts only store up bigger costs for the future. The economic report and today’s psychosis summit are being supported by the Department of Health. The health and social care system saves £989 for every patient who receives Cogitative Behavioural Therapy (CBT) due to reduced hospital admissions. This blog post was first published on the LSE News page and is written by Candy Gibson from the LSE’s Press Office.